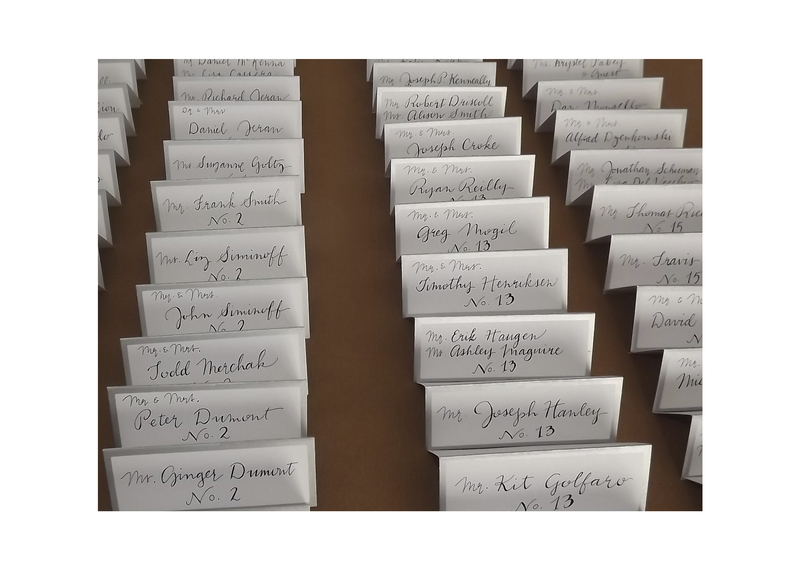 I just finished some lettering work for a friend whose daughter is getting married soon, first addressing the wedding invitation envelopes, then hand-lettering the place cards for the reception. 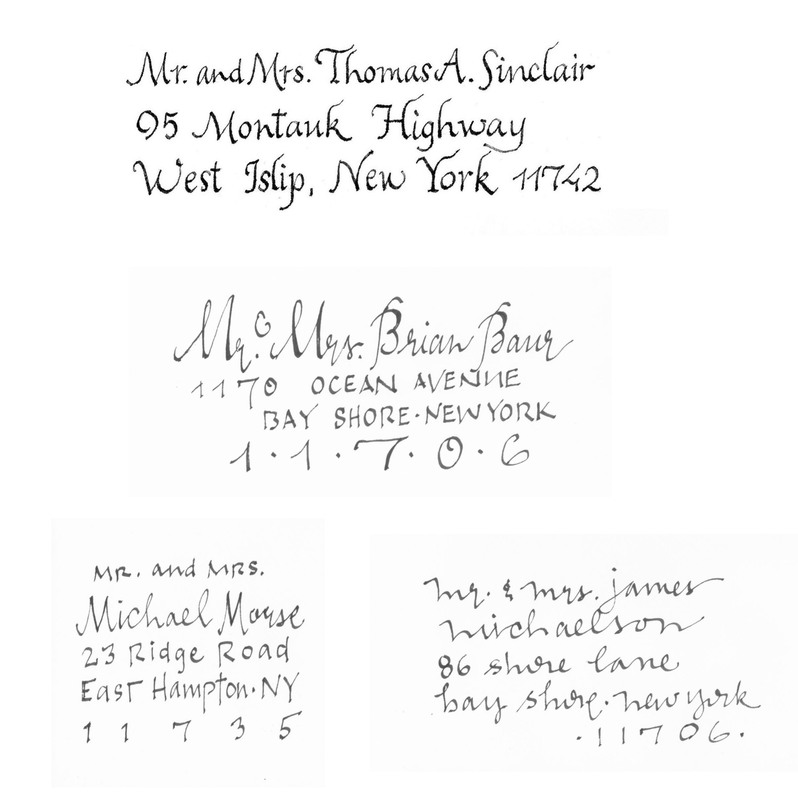 These are some of the samples I showed the bride-to-be for the envelopes. She liked a more traditional style and chose the first example below. 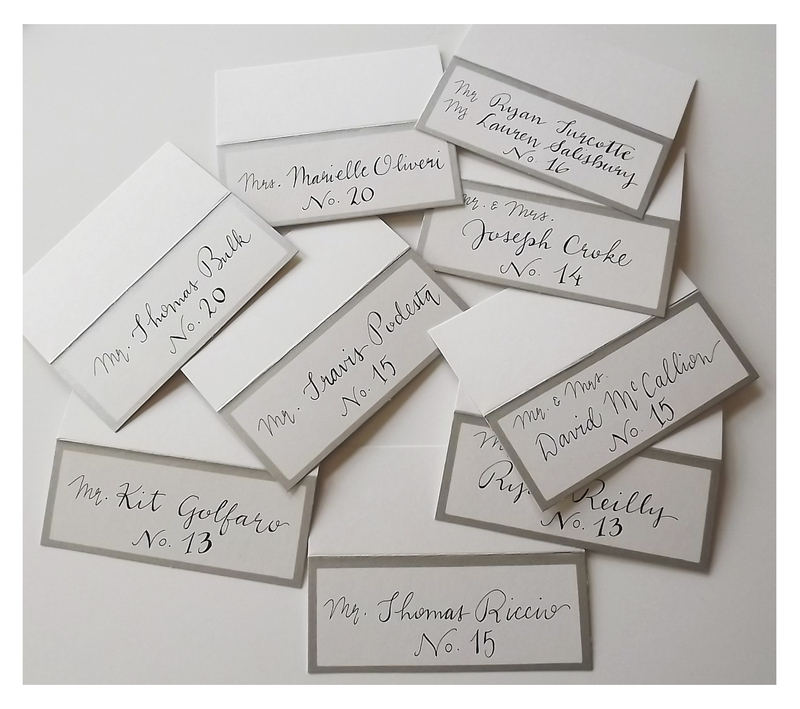 The table seating cards for the reception were done in a freer, lighter style. 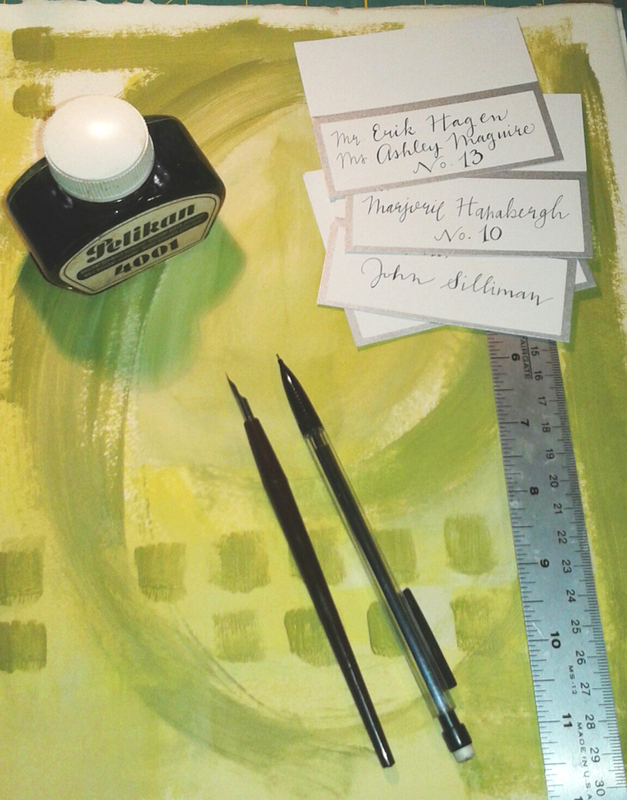 I felt the line of a fountain pen was too heavy for the 3.75″ by 1.5″ cards, so used a dip pen and black ink for a thinner, more delicate line. The ruler and pencil were out because I sometimes make a faint pencil line as a guide to keep things straight, but didn’t really need to do that this time because of the flowing style of the lettering. Over one hundred twenty cards were done. Not all at once, mind you – I had my back and cramping hand to think of! It has been a fabulous week in Portland, Oregon. I arrived on Friday night and spent the weekend with my daughter, Caitlin, walking neighborhoods, shopping, eating, and even hiking at Horsetail Falls. The Art and Soul Workshops started Monday morning at nine o’clock. I had signed up for a two-day session with Donna Watson called Boro/Wabi Sabi:The Japanese Spirit of Collage. (http://www.donnawatsonart.com) The tables were set up to allow two of us per table and we all eagerly spread our supplies out. I shared the table with Sandy, who owns Loose Ends Paper and Art in Salem, OR with her husband. After we chatted awhile, I realized I used to see her demonstrations on The Carol Duval Show on HGTV. On Wednesday I took the Stencils and Masks workshop with Jane Davies, all about layering shapes and textures onto painted backgrounds. 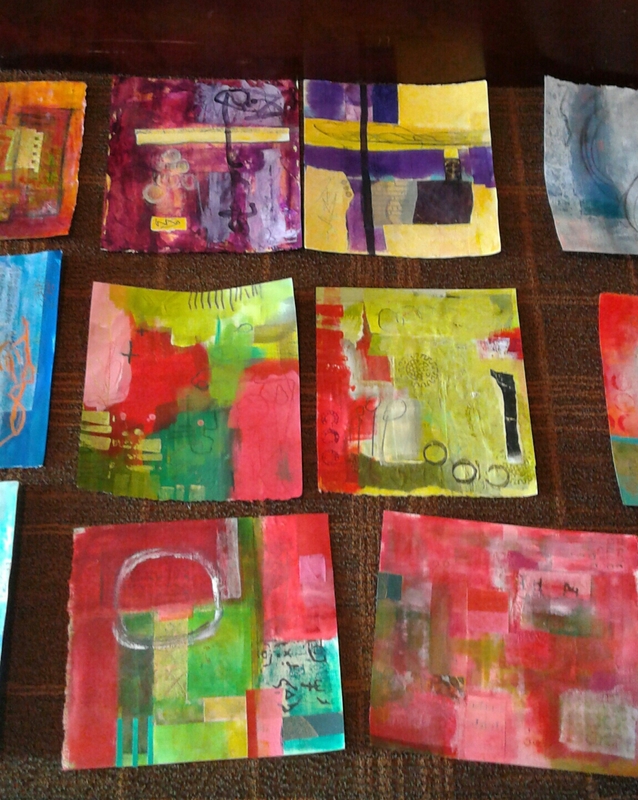 (http://www.janedaviesstudios.com) Her approach to art-making is exuberant, loose, colorful. We had a lot of fun experimenting with color and techniques. 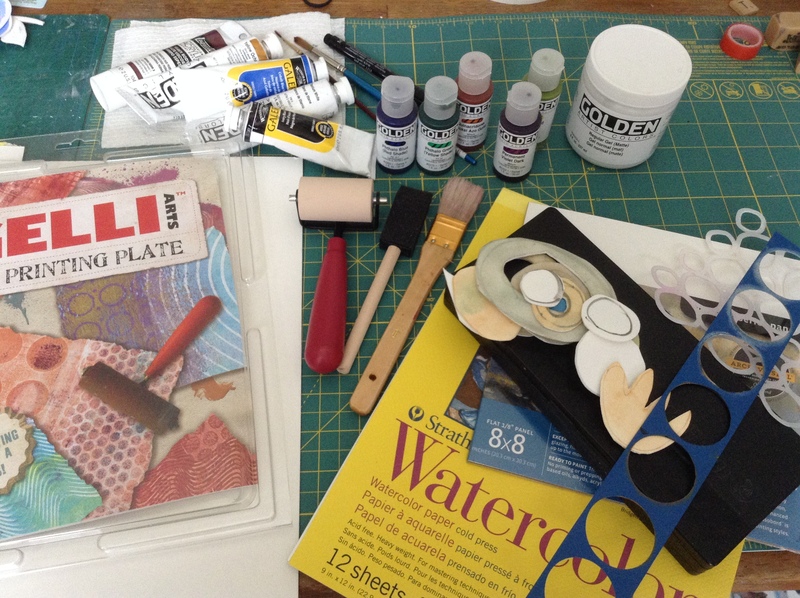 With both artists we used the Gelli plate, which was new to me. We applied acrylic paint to the plate with a brayer and pulled prints, using masks and stencils to make shapes and adding layers of paint until we were satisfied with our piece. I loved this class! Thursday with Jane Davies again – Balancing Opposites/the Yin And Yang of Composition. We didn’t use the Gelli plate this time, but studied the relationship of elements in collage and painting. The way color, texture, busy-ness,calm, line, shape, and contrast all affect our artwork. 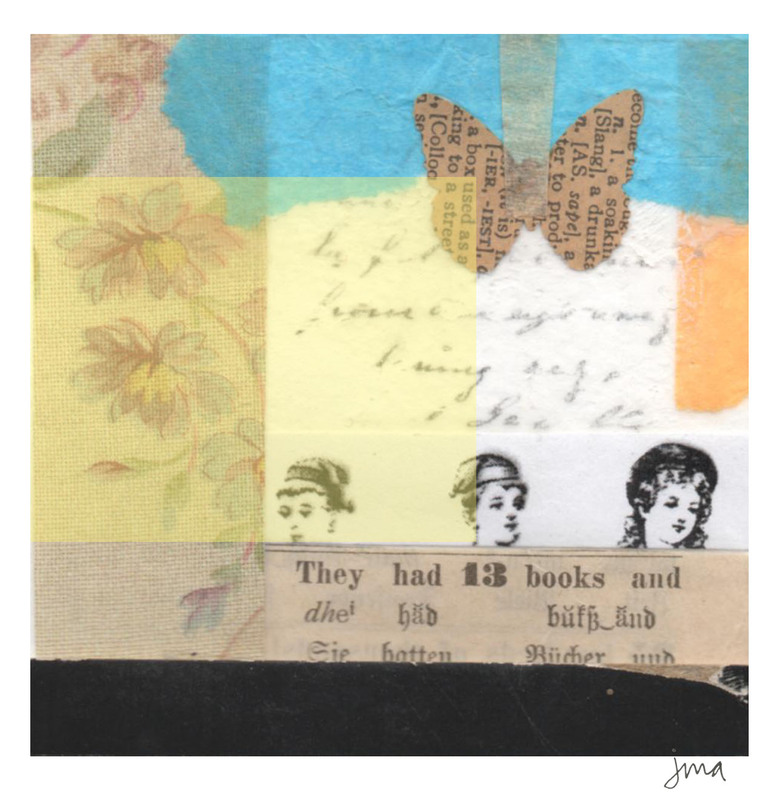 Jane generously shares her talents online with a number of tutorials, so check it out. Overall, my first experience with the Art and Soul Retreat was a really good one. I’m so glad that I treated myself! I’m off to Portland, Oregon for the Art and Soul Retreat this week. Yay! It’s something I’ve wanted to do each year I see it advertised. And with my daughter living in Portland now, I thought it was time to jump on it. Over a four-day period, I’ll be taking different collage workshops, two days with artist Donna Watson and two days with artist Jane Davies. They are both favorites of mine, and I’m excited to get a chance to learn from them. Can’t wait to spend time with my daughter and to dive into creating! I’ve just spent the first few days of the new year “cleaning” and trying to organize things in my art room. (Again!) It’s great going through bins and drawers and shelves and rediscovering things I’d forgotten about. But I’ve decided that this is the year I am going to have to weed out some of my supplies! I have collected so many odds and ends – cabinet cards, atlases, maps, dictionaries, wallpaper books, songbooks, letters, postcards, stamps, fabric, paper, paper, paper – with the intention of using it in my collage work, but there is just no way I could possibly use all I have in a lifetime. I have so many old books that I could never bear to rip apart, so I would scan the pages I wanted to use. Not quite the same feel, though, as the real aged paper. So rip old books I will! (Nothing valuable, of course). And I will use the ephemera I’ve collected and hoarded. Enough of holding onto things! This is a quick little assemblage I made with some of the scraps I came across.